In need of affordable, fast lawn care services in Asheville, North Carolina? Lawn Love makes it easier than ever before to get the best rated lawn care services. By bringing lawn care into the modern century, lawn love has made getting lawn care services in your beautiful mountain town as easy as the push of a button. Get an instant quote for lawn care services near you such as lawn aeration, lawn mowing, leaf removal, gutter cleaning, gardening, yard care, weed control and more. See why we're rated the #1 lawn care service company in Asheville, NC. Asheville, NC is known for its beautiful mountains, pristine hiking, their emerging craft beer and restaurant scene and by being one of Obama's favorite vacation destinations. 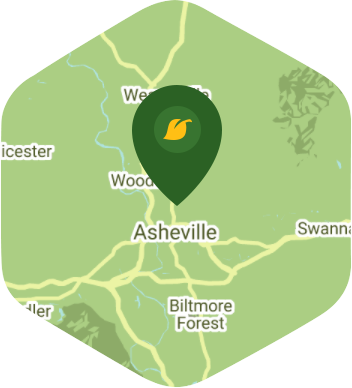 There's so much to enjoy in the Asheville area, so why would you want to spend anytime doing rigorous lawn care service work while you could be enjoying all that Asheville has to offer. Kick back, relax, and enjoy your city while Lawn Love handles all of your lawn care service needs. Call today or submit for a free, easy instant quote and let Lawn Love take your lawn care service needs from there. It looks like the expected precipitation in Asheville is 0.05 inches, which means you will probably have to water your lawn today.